Dear E-Commerce Business Owner, it’s time you recognize the latest trend in online marketing – videos. Perhaps you think videos are useless, or they’re too difficult to make, or they’re cheesy. Think again. Videos have become one of the most effective and popular online marketing tools around, and it’s about time you jumped on the bandwagon. 1. Google likes videos. Actually, Google likes to diversify their search results to give users an array of information that they think will be most useful. This includes maps, pictures, and, you guessed it, VIDEOS. Having videos related to your company or products can help improve your chances of ranking higher in Google search results AND videos tend to stand out among a long page of text. 2. People love to share. Thanks to social media, your customers will do a lot of the “work” for you when it comes to video marketing. Practically everyone has a smart phone, and they love nothing more than to share videos on their Facebook pages, Twitter pages, E-mail, etc. As long as your video is interesting and the right length, people will want to share it with their friends. 3. Speaking of length, size matters. Thanks to the Internet, the average attention span of an adult human is comparable to that of a goldfish, maybe worse. For that reason, many people tend to watch a video for about 20 to 30 seconds before moving on to something else. However, 20 to 30 seconds is the perfect length for videos to show a new product, answer a quick question, or give a fun piece of trivia. On the other hand, for product demos and tutorials, long videos make a lot more sense. Customers who are considering a new product or have just purchased one, will be compelled to sit through a 15 to 20 minute video to learn how their new piece of equipment works. This is especially true for products that are more technical or require a lot of assembly. Of course, there is also a place for videos in between those two ranges. For example, below is a helpful video tutorial from ProductCart that is just over 8 minutes long. It all depends on your audience and what you’re trying to show them. 4. Lots of info, so little time. The great thing about videos, is their ability to creatively give your customers the right amount of information and visuals simultaneously in a short period of time (before they lose interest). They also allow you to show parts of your store or products that can be hard to capture in images or words alone. 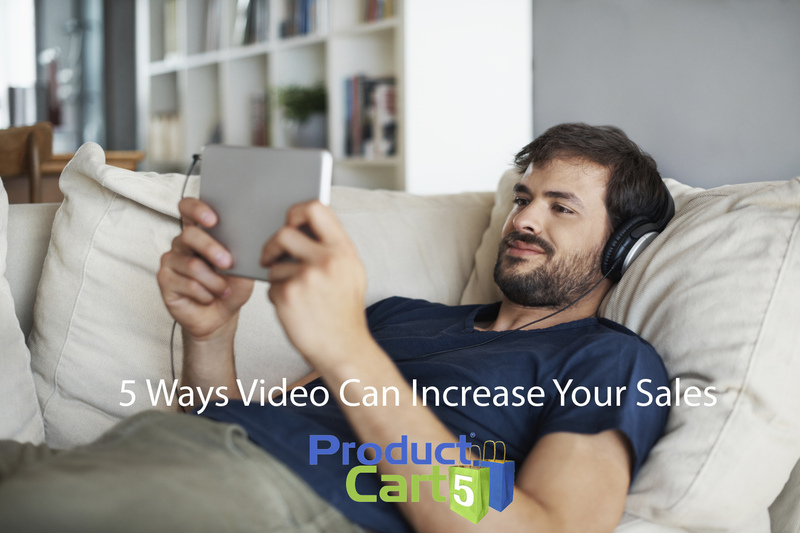 One excellent example of this concept is Product Demo Videos. For many of you, your product requires a little explanation for how it works, how to use it, etc., and it is WAY easier to explain that to your customers in a video. Another great trick? Having your videos link to the product page on your website so customers can simply click the video to purchase what they just saw. 5. Keepin’ it real. Finally, videos are an excellent way for E-commerce sites to get up close and personal with their customers. They allow you to give your staff, product, or company some personality and make customers feel more connected to the brand AND increase brand loyalty. E-commerce owners can use videos to introduce themselves to their customers, answer Frequently Asked Questions (FAQ), or let customer give their own testimonials about how much they love your product (because we know they do). To reiterate, videos are a great tool for E-commerce business owners to increase their customer engagement, product awareness, and ultimately their sales. We touched on them throughout the article, but here are a few types of videos you (or your awesome marketing team) should add to your online marketing strategy.